But...God ordered it. The big difference. This is what you said: "If somebody can show me a pre-christian jewish use of iconography I will..."reconsider" my opinion on icons. " I just showed you a pre-Christian Jewish use of Iconography, and you won't reconsider. And if God commanded Icons to be made, how can you say Icons are wrong? Did God make a mistake? No, because there is a "fluidity" in the instruction, the Torah of God. So he can say whatever he wants, whenever he likes and we must obey. Yesterday he asked for animal sacrifices, today he has provided something different for instance. He said idols degrade him (second command) but he on a very specific ocasion asked for a specific representation in the Ark of the Covenant. No, because there is a "fluidity" in the instruction, the Torah of God. So he can say whatever he wants, whenever he likes and we must obey. Yesterday he asked for animal sacrifices, today he has provided something different for instance. So now you are rejecting Icons because they are a pre-Christian Jewish practice. If somebody can show me a pre-christian jewish use of iconography I will..."reconsider" my opinion on icons. No, show me a synagogue with icons as proof, that way I know the existing tradition allowed icons. But no icons. There's even a story in either the bible or the talmud which tells of each of the fathers of the 12 tribes asking for some stones God used to represent them, so a bunch of little shrines could be made, and God said "No". Also the Story on Moses having to be buried in secret. Plus only Samaritans built icons, and they disobeyed in a bunch of stuff. So please provide evidence it is ok to build idols in contravention to what St.Paul ordered in Jerusalem as the MINIMUM standard the faithful should adhere to. Where's my Jewish icon man? I'm anxious for it so I can go to the local icon shop and "reconsider" my opinion now that icons are ok with God and not idols. Please find it. On the day of Our Lord's Nativity...perhaps you should put more study into the meaning of the Incarnation of the Lord. If you are looking for us to produce ikons of people written by people prior to the Incarnation, it won't happen. The whole point of having an ikon at all is to reflect the New Humanity, the New Adam that is Christ Jesus. The old humanity was dragged down into sin by Old Adam. "Behold the man! Behold Adam, but not the Adam who sinned against God and dragged down the Creation in his rebellion, but the second Adam, the new Adam, the last Adam, who obeyed God and exalted the whole Creation in his rising. Behold the man, Adam as he was meant to be. Behold the New Adam who is even now transforming the Old Adam's failure into glory! Behold the man! Behold the first-born of the dead. Behold, as in the icon of the Resurrection, the man who descends to reach Adam and Eve and raise them up in his ascent. Behold the man who will enter the realm of the dead and forever crush death's power to keep people down." Oh, and that "synagogue" you showed as proof for icons was built by samaritans. Do you have proof for this? No, show me a synagogue with icons as proof, that way I know the existing tradition allowed icons. What, you mean the Icons of the Cherubim in the First and Second Temple (the centre of Jewish worship) aren't good enough as proof? What else can I say then? Depictions of God the Father are forbidden in Orthodoxy since He was unseen. God however became incarnate and was an image of the Father. He was here on earth and seen with human eyes and thus became depictable. Depictions of God the Father are forbidden in Orthodoxy. God the Logos however became incarnate and was an image of the Father. He was here on earth and seen with human eyes and thus became depictable. So why were the Cherubim able to be depicted in the Temple? Were they incarnate? The point of the depiction of Christ in Icons is that God can be depicted in Icons. An Icon depicts an hypostasis, so an Icon of the Incarnate Christ is an Icon of the Hypostasis of the Second Person of the Trinity. An Icon of God the Father as the Ancient of Days is based on the vision of Daniel where the "Son of Man" ascends to the Presence of the Ancient of Days. The fact that Christ is also shown as the Ancient of Days in Scripture doesn't mean that Both the Father and the Son cannot be the understood as "The Ancient of Days". Whoever has seen Christ has seen the Father. Is it OK though Isa? Quite OK. The gates of Hell will not prevail against the Church. I once saw a first century catacomb depiction of either Jesus or Peter where the artist just copied an apollo statue and substituted something the idol was carrying for a lamb (Christian symbol) to make it more "kosher". Solomon didn't build the Temple: Hiram of Tyre's masons did. As it is clear they did so according to the Phoenician (i.e. pagan) idea of what a Temple should be: Moses left no instructions on building a Temple. And yet at the Temple's dedication the Divine Presence came to dwell in it. You are aware that many of the earliest Churches are build out of older Temples, the Parthenon perhaps the best known example, the name now not refering to Athena but to the Holy Theotokos. Moses didn't institute the monarchy: the Sons of Israel pestered Samuel for a king so they could have one just like the pagans. And yet God blessed the monarchy into a Throne which lasts forever, upon which sits the Anointed (in Aramaic/Hebrew/Greek?). Such a statue wouldn't be more "kosher," just Christian:Christians don't worship Apollo. The whole thing about idolatry is that it "degrades" God. You make God conform to what you want him to be when you draw a picture of him. "He who has seen Me has seen the Father." We don't have to make up a picture of God, as "we beheld His glory, the glory as of the Only Begotten of the Father." Abbot Theodore Aeliotes told of a holy hermit on the Mount of Olives, who was much troubled by the demon of fornication. One day when he was sorely tempted, the old man began to complain bitterly. "When will you let me alone?" he said to the devil "be gone from me! you and I have grown old together." The devil appeared to him, saying,  "Swear to me that you will keep what I am about to tell you to yourself, and I will not trouble you any longer." And the old man swore it. Then the devil said to him, "Do not worship this image, and I will not harass you." The image in question represented Our Lady, the holy Mother of God, bearing in her arms our Lord Jesus Christ. You see what those who forbid the worship of images hate in reality, and whose instruments they are. The demon of fornication strove to prevent the worship of Our Lady's image rather than to tempt the old man to impurity. He knew that the former evil was greater than fornication. So let me see...a demon tormented a monk with lustful thoughts, then the monk said "stop bothering me" and the demon replied "if you worship the icon I will stop bothering you" and this is a great "proof" that its ok to worship icons? That a demon told a man that if he worshipped an icon he would be ok? Plus this "holy monk" sweared and broke his word. The story you have posted says the demon would leave him alone if the monk STOPPED venerating the icon (NOT if he started to venerate it). As this icon was "Our Lady, the Holy Mother of God, bearing in her arms Our Lord Jesus Christ," consult Matthew 2:11. Btw, swearing oaths to demons is like minors signing contracts: they have no validity. REALLY? That's interesting, as several of the icons, a couple of which I showed, are scenes that are not in the Samaritan Bible. So, what makes you think it was Samaritan? Regardless, so now any image of a person in a particular pose holding an object is automatically a copy of a pagan god, and is therefore idolatry? That's kind of ridiculous. So an icon of Christ enthroned must be a ripoff of the Lincoln Memorial - they're both sitting down! and have a beard. And a Hebrew first name. You make God conform to what you want him to be when you draw a picture of him. If they had cameras in the 1st century, would taking a photograph of Christ "limit" him? It's all about the incarnation. God became a human. He voluntarily took his limitless self, and without compromising that limitlessness, became a limited being, subject to all realities of the flesh, including being able to be depicted. If you have a problem with that, perhaps you should take it up with God instead of iconographers. I think we are going to have another "Blood of God" problem. This is not an issue of icons, this is a Church authority issue, IMO. King Abgar spoke Aramaic. The Didache was in Aramaic (our Syriac version=correct). I have proof, Eusebius in his history says he translated the letters and other documents from the Edessene Archive. Well, if Eusebius said this and you have proof that he did, I'm sure you can post this proof here so we can read it ourselves. Otherwise, you speak as a person with no credibility. D'oh! I forgot. You guys burn evidence. The 4th century church historian Eusebius, Bishop of Caesarea, records a tradition concerning a correspondence on this occasion, exchanged between Abgar of Edessa and Jesus. Eusebius was convinced that the original letters, written in Syriac, were kept in the archives of Edessa. Eusebius also states that in due course, after Christ's ascension, Thaddeus, namely Addai (called Addaï), or one of the seventy-two Disciples, called Thaddeus of Edessa, was sent by Thomas the Apostle in AD 29. Eusebius copies the two letters into the text of his history. when its main point is the creation of the Icon not made by the hands of man. Btw, God never commanded the Jews to build synagogues. The story you cite may come from the Talmud, but since we walk according to the Apostles and not the Pharisees, why should we care what they say? Where do you get this idea about the Samaritans? I think you are confusing St. Paul with St. James, which has nothing to do with venerating Icons (even IF they were idols, we don't sacrifice animals to them). First show us a pre-Christian synagogue. 1)We have the Temple scroll, there was a pre-specified plan for the temple, not a random pagan design. Absurd to say God would allow pagan contamination where he placed his presence. 2)The Mandylion was MADE by God, it is the image of God, the presence of God shining on the clothe (Jewish concept of the Shekinah, like on Moses when he descended the mountain). So its OK. So Mar Mari and Addai can ask us to revere the Mandylion. 3)I don't know if the story was in the talmud, plus even though much of the talmud is gunk, much of it is useful and contains legends and knowledge which the apostles drew on. We don't use the book of Enoch but Jude quoted it. Plus Moses was buried in secret because God did not want his tomb turned into a shrine full of iconography. 5) Good you remembered: God is not "incarnate" flesh, he does not have blood. Thus it is still forbidden to depict spirits with images. Worship the Father in spirit and in truth. 6) OK, as soon as I read the words "Icon" and "Demon" in the same story I became suspicious of demonic attempts at making people worship idols. I'm still suspicious, maybe the demon wanted to give the impression that it is ok to use icons. If he was worshipping a holy icon why was he demonically possessed with lustful thoughts? 7)No Jewish icon as of yet, only samaritan ones. The Samaritan Torah is very similar to the original except they switched Mount Zion to another mountain associated with Joseph and a couple other things. I thought Christ was a good Samaritan and commanded us to be the same. Well, its a parable oz. I see Isa has escaped...seems my doubts were too much for our learned elder. Still waiting for my Jewish Icon, surely all those jews must have had at least ONE icon. For the sake of consistency, wouldn't you need to say it's the image of the man in whom God chose to dwell? These aren't even icons. This is just a mosaic. And you have not said what gives you reason to believe that the synagogue at Dura Europas was Samaritan. Besides the obvious problems anyone EO, RC or OO would have with this christological statement, it seems to contradict you're previous statement that the mandylion was an image of God. If it's forbidden to depict spirits with images, then why would God demand the depiction of cherubim in the temple? And what about the fact that your own church had images for at least 14 centuries? The demon was attempting to get him to worship an idol. He was attempting to get him to stop worshipping an icon. Why was he having lustful thoughts if he was worshipping a holy icon? Why so many continue to struggle with sin when they partake of the very body and blood of Christ? Proof that the Dura Europas synagogue is Samaritan is still yet to come. I consider it Samaritan. Even if not, maybe proselytes made the frescoes (in one synagogue Roman proselytes made King David look like Orpheus). Church of the East didn't have icons, proof is muslims copied East Syriac Christianity practices including iconoclasm. Not our fault Mohammed was a heretic though. While my Christology is obvious to you guys, I always refer to the person of the Messiah as God instead of talking of the divine nature and human nature sperately which causes confusion. God is not "incarnate" flesh, he does not have blood. Thus it is still forbidden to depict spirits with images. Worship the Father in spirit and in truth. God the Father is not incarnate flesh, but God the Son is. And he who has seen the Son has seen the Father, thus we have pictures of God. surely all those jews must have had at least ONE icon. They did. The Cherubim on the Ark of the Covenant and the Cherubim on the Curtain of the Holy of Holies. This isn't a Masons' Treasure, is it? What "Temple scroll" are you talking about. Go with that Apostolic thought. 3)I don't know if the story was in the talmud, plus even though much of the talmud is gunk, much of it is useful and contains legends and knowledge which the apostles drew on. No, they didn't. Consult Council of Jerusalem. We don't use the book of Enoch but Jude quoted it. Plus Moses was buried in secret because God did not want his tomb turned into a shrine full of iconography. Well, that didn't work out. What do you base you assertion on? Btw, interesting that Satan wanted Moses' body. Why? Interesting link. Underlines the problem:pre-Christian synagogues have n't survived. Lent is coming, and I hope to be a Good one. For many deceivers have gone out into the world, those who do not acknowledge Jesus Christ as coming in the flesh. This is the deceiver and the antichrist. 2 John 1:7. 6) OK, as soon as I read the words "Icon" and "Demon" in the same story I became suspicious of demonic attempts at making people worship idols. Why should that be suspicious? The demons are expert at citing Scripture. I'm still suspicious, maybe the demon wanted to give the impression that it is ok to use icons. If he was worshipping a holy icon why was he demonically possessed with lustful thoughts? I haven't seen any Samaritan icons on this thread yet, except the one on your link. See the Jewish version above, similar in age. No guys, just show me an icon made by...a sanhedrin member. For his house, private edification and worship of God. Nothing which God made himself counts because God does whatever he wants, He will be what He will be (that is his name). When shown in the Bible where God commanded images to be put in the temple, you said He's God and can do whatever he wants- but say this is no proof that God is actually ok with iconography. When the mandylion is brought up, you say its ok to reverence it cause its an image of God, yet you deny that God became flesh. When shown pictures of 2nd and third century iconography, you asked "but does that make it right?" When shown Jewish iconography, you deny its Jewish for no other reason than that you "consider it Samaritan." When shown compelling evidence that your very own church had iconography for at least 1400 years, you barely even comment. Does it not seem to you that you're evading and dismissing all evidence? No, because God made the Mandylion so its ok, much like he asked for the Cherubim. Plus The COE couldn't control what every single person did in its jurisdiction, why sometimes Chinese converts engaged in ancestor worship even though its forbidden. The same goes for the Jews- they couldn't control people who converted who wanted to draw king David as Orpheus. Plus I already showed that Samaritans loved iconography and mosaics (mosaic big Greek Hellenistic thing too, many bad Jews who sided with the Seleucids and engaged in forbidden practices). Also we don't know where Moses is buried, and Satan wanted the body for desecration or to incentivate some sort of idolatry most probably. LOL. I actually do have a life off of the net (in fact, I should be spending more there and less here). You've been given several Jewish icons, and I just posted some more. Again, what makes you say the Dura Europos icons are Samaritan, as they are demonstrably not. OK, maybe it was an error to ask for a Jewish icon. Maybe I needed to ask for an icon made by a pious Jew for his own house and edification who did not adopt hellenistic Greek practices. 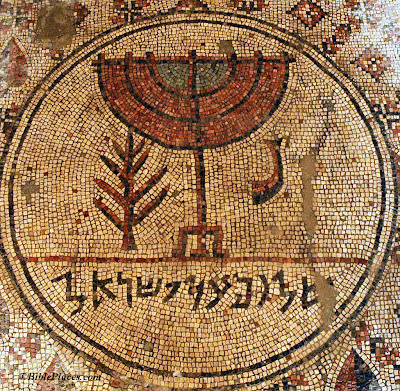 Some Jews reversed their circmucision to compete in the olympics to be cool with their Greek neighbors, maybe this mosaic thing was a "loophole" some liberal individuals adopted which did not reflect the mainstream of judaism. Further, Menorah like the Cross in the COE and the Cherubim is an "approved" symbol they could depict only because God gave permission. I'm not a docetist muslim. I believe Jesus Christ came in the flesh, his divinity and humanity side by side. This verse was intended for Ebionites sabotaging the Christian faith or gnostics. WELL. Rome (or Babylon) has spoken I guess. Ex cathedra? Even if not, maybe proselytes made the frescoes (in one synagogue Roman proselytes made King David look like Orpheus). Islam wasn't iconoclast until their second civil war (c. 700): the sources are clear that the Kaaba had an icon of the Theotokos (which MUhammad covered with his body to protect as his followers destroyed the idols there) and the Sacrifice of Isaac. I always refer to the person of the Messiah as God instead of talking of the divine nature and human nature sperately which causes confusion. We Orthodox are quite clear that Christ is God. Show us ANYTHING made by a sanhedrin member. You would be shocked how much doesn't survive. Or he wanted to deprive us of his relics. Like he wanted to deny us St. Polycarp's. But the jealous and envious Evil One, the adversary of the family of the righteous, having seen the greatness of his martyrdom and his blameless life from the beginning, and how he was crowned with the crown of immortality and had won a reward which none could gainsay, managed that not even his poor body should be taken away by us, although many desired to do this and to touch his holy flesh. So he put forward Nicetes, the father of Herod and brother of Alce, to plead with the magistrate not to give up his body, "lest," so it was said, "they should abandon the crucified one and begin to worship this man" -- this being done at the instigation and urgent entreaty of the Jews, who also watched when we were about to take it from the fire, not knowing that it will be impossible for us either to forsake at any time the Christ who suffered for the salvation of the whole world of those that are saved -- suffered though faultless for sinners -- nor to worship any other. For Him, being the Son of God, we adore, but the martyrs as disciples and imitators of the Lord we cherish as they deserve for their matchless affection towards their own King and Teacher. May it be our lot also to be found partakers and fellow-disciples with them. The centurion therefore, seeing the opposition raised on the part of the Jews, set him in the midst and burnt him after their custom. where the Lord will permit us to gather ourselves together, as we are able, in gladness and joy, and to celebrate the anniversary of his martyrdom for the commemoration of those that have already fought in the contest, and for the training and preparation of those that shall do so hereafter. Lots of luck. Again, I don't think you realize how little material we have to go on, and what we have, supports us, an embarrassment for Protestants, who chorttled on in the 1800s with the iconoclast views, as the ancient synagogues had not yet been discovered. Oh, when did He do that? He came in the flesh, did not become flesh or else the divinity suffers and dies which is the "M-word" heresy nobody except Copts and OO sympathize with. "As Surely as YHWH Lives" First words a Jewish scribe would write on a scroll before asking for the blessing that his work be an accurate rendering of scriptures. The good scribes too. Plus The COE couldn't control what every single person did in its jurisdiction, why sometimes Chinese converts engaged in ancestor worship even though its forbidden. And that ancestor worship worked its way all up to the Patriarch of the COE? And how did the Muslims inherit iconoclasm from the COE when it was the COE who was defending iconography against the Muslims. The Word became flesh and dwellt among us. Cite Eastern Syriac ahem. (show Eastern and Western Peshittas, and translation with literal renderings). And the Word Flesh became (middle aorist, i.e. agent does to/for self at one point in time). And the Word was Flesh and dwelt among us. Why are you speculating? Too many assumptions increases the chance of error. No, somehow you got the grammar mixed up there. The demon is telling him that if he refrains from worshiping the icon that he will leave him alone. If somebody can show me a pre-christian jewish use of iconography I will..."reconsider" my opinion on icons. But nobody can because icons were prohibited and only the samaritans built them. And its not ok to "baptise" idols and then re-use them. So you actually don't at all consider the possibility that the Word becoming physical and visible (essentially the Word's humanity was the first Christian icon) changes the acceptability of iconography? No, show me a synagogue with icons as proof, that way I know the existing tradition allowed icons. But no icons. You're actually suggesting that you think that modern synagogues are a proper representation of the ancient temple of Jersualem? You're denying that the Logos has flesh and blood that He took from Mary? Still waiting for my Jewish Icon, surely all those jews must have had at least ONE icon. In my disscussions with open-minded Protestants about the Orthodox Faith,the one thing that seems to be a hang-up with them are the use of Icons,I've been disscussing with one,who quotes Early Church Fathers,such as Irenaeus,in such a way as to condemn their use,I've read the quotes and I take from the quotes that He is condemning their mis-use,not an outright condemnation. Any suggestions on how to better explain their use in the Early Church? It took me years to get over the Iconoclastic hump. It got real bad back when I followed David Bercot's ministry. From how I see it, from what I knew then, as well as what I know now and in how I finally came over the hump back in 2003 or 2004. I will say that you will find a number of early christian writers argue against it, but you will also find christians doing it regardless, and so, you will find christians on both sides of the issue. Christians of both sides always had icons of signs and symbols, but they did argue about human image icons. It took the church centuries to lay the issue at rest, and that came about when the issue of the INCARNATION was brought into it. When I finally accepted human image Icons, I started to see how they are a more consistant continuation of the signs and symbol Icons. If people want to be "strict" adherents of the command found in exodus, then we will see that christians broke that "strict" interpretation from the jump, for if you can't make an image of anything under the ocean, then we can't make "fish" icons, if we can't make images on anything on land, then we can't make crosses, and if we can't make any images of anything in the air, then we can't make birds, and ancient christians made alot of bird images, and so, we never really followed the command from that kind of interpretation anyway. If you can make an image of a fish, tree, fruit, or a bird, then why can't you make an image of God INCARNATE? It only makes perfect sense to me. And so, anyone who picks on you about icons just let them know that they are not being consistent themselves. Anyone who watches tv is watching 20 to 30 icons per second. If you go to the theatre, then you are watching hundreds of icons per second. We have icons all over the place on Microsoft windows and the internet in general. We have them in books, and so, modern iconoclasts are just being hypocrits. But the truth of the matter is the Reformed branch of the protestant Reformation, including England for she is also seen as being part of the "Reformed" tradition. But the Reformed tradition always had a "NESTORIAN" tendency, and I think this played into their ICONOCLAISM as well. Even today, many calvinists have a hard time saying that God INCARNATE died on the cross. They really have a hard time with that, And many have a hard time seeing baby Jesus as God INCARNATE,.....they just really have a hard time with the manger scene in that way.